SUNDAY JANUARY 7th - 1:00 P.M.
הנך עומד\ת לצפות בסרט היסטורי יחודי ומרתק, העוסק בתולדות והקמת מדינת ישראל. הסרט הופק לרגל אירועי יום העצמאות ה-56 למדינת ישראל. כל העובדות המובאות הינן אותנטיות לחלוטין ועברו בדיקה יסודית ומקיפה. להוציא לאור את האמת ההיסטורית, בצורה שתהא אובייקטיבית ככל האפשר ומבלי לפגוע באף אדם או ארגון כלשהוא בישראל בפרט ובעולם כולו בכלל. 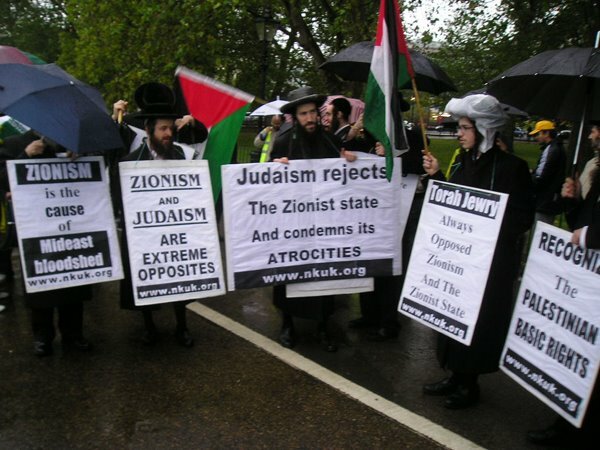 Even anti-Zionist Orthodox groups slamming Neturei Karta following Holocaust-denial event. While Duvid Feldman was attending a conference in Tehran last week that questioned the reality of the Holocaust, back home in Monsey, his 10 children were “suffering” at the hands of other ultra-Orthodox children thanks to “foolish” media coverage of the event, his wife said Tuesday. In Manchester, England, Aharon Cohen, another conference attendee, returned home to find his house besieged by other, mostly Orthodox Jews outraged by his participation in the same gathering. Meanwhile, as of last Sunday, Rabbi Moishe Arye Friedman was still in Tehran, afraid to return home at all. He feared that Austria, his home country, might prosecute him for attending the conference under a law that makes it a crime to deny the Holocaust, punishable by up to 10 years in prison. Please SIGN THE PETITION to place the Neturei Karta in Cherem! Here is the original dust jacket for Jimmy "the peanut farmer" Carter. Making headway! Keep up the fight! The Beit Din Tzedek (BaDaTz) joined other hareidi religious rabbinic courts in formally condemning an anti-Zionist group that participated in a Holocaust denial conference in Iran 10 days ago. The same group had attended the funeral of chief terrorist and former Palestine Liberation Organization chairman Yasser Arafat. Later documents showed that they have also been funded by Palestinian Authority terrorist organizations. Chief Ashkenazi Rabbi Yona Metzger called for a cherem (excommunication from the Jewish community) of the group last week. He was quickly joined by the leadership of the Eida Haredit, an anti-Zionist Jerusalem-based council of Hassidic courts and other hareidi religious groups, including the Neturei Karta, that was equally harsh in its response to the group’s actions. The Satmar Chassidic sect also quickly distanced itself from the group, which according to the Haaretz news service was comprised of American and West European members of the virulently anti-Zionist Neturei Karta and Satmar Chassidic groups. The Satmar Chassidic Court issued a statement last Thursday calling on Jews “to keep away from them and condemn their actions,” an order tantamount to placing the men in cherem, similar to the call by Rabbi Metzger on Thursday. 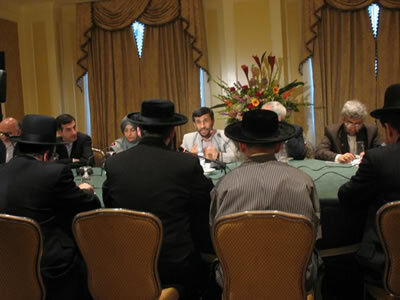 The participation of the Neturei Karta members at the conference organized and led by Ahmadinejad was “act of madness,” said the Satmar statement, adding that the group had “trampled on the memory of their ancestors and people. They embraced the disciplines and followers of their murderers." This same group kissed and hugged Ahmadinejad when he appeared in New York to attend the opening of the United Nations General Assembly in September. 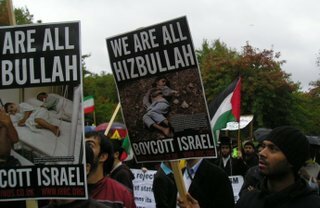 They also exhorted Jews to pray for a Hizbullah victory during the second war with Lebanon after two IDF reservists were captured by the terror organization in a cross-border raid this summer. The ruling was signed by Badatz chairman Rabbi Tuvia Weiss and other rabbinic judges and distributed in Jerusalem on Wednesday. KEEP UP THE FIGHT! SIGN THE PETITION TO EXCOMMUNICATE THEM NOW! A special bracha to those who take the time to read this blog. Thank you for sticking with me. This site was dedicated on Chanukkah and it continues to grow. This is the time of re-dedication and may we all me mechazik to grow and eventually gaze upon our Holy Temple, rebuilt in Jerusalem. Remember the true meaning of Chanukkah: how a small band of Jews, led by a noble family of Kohanim defeated the greatest army in world. Though Greek style, language and custom were considered the "in thing," the new and cool, the wave of the future, our ancestors rejected it and stayed true to Judaism and G-d's Holy Torah. There is no more Greek Empire. There is Judaism. There is no more Roman Empire. There is Judaism. There is no more Babylonian Empire. There is Judaism. There is no more Assyrian Empire. There is Judaism. There is no more Spanish Empire. There is Judaism. There is no more Nazi Reich. There is Judaism. There is no more Soviet Union. There is Judaism. The meaning of Chanukkah is to stand firm in Torah and Yiddishkeit. Don't compete with Christians this season. Don't demand "seasons greetings" and try and connect Chanukkah with Christmas. This is the antithesis of our Holiday. Stay true to your G-d, your Heritage, your People. You are the Children of Abraham, Isaac and Jacob. Am Yisrael Chai! The Nation of Israel lives! 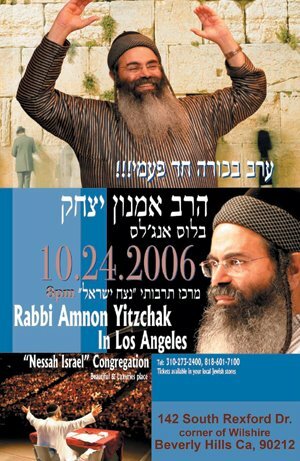 Israel’s Ashkenazi Chief Rabbi Yona Metzger and the Save the Nation and Land rabbinic organization have called for members of the anti-Zionist Neturei Karta sect to be excommunicated. The unusal calls follow the visit to Iran by a group of senior officials of the small sect to take part in a conference aiming to present evidence that the Holocaust never took place. 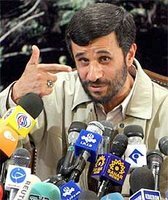 Photographs of the hareidi-looking Jews happily embracing Iranian President Mahmoud Ahmadinejad have been widely circulated in many countries. Chief Rabbi Metzger called on all rabbis and communities in Israel and around the world to honor the memory of the Holocaust victims by adhering to the cherem call against the Neturei Karta members. Rabbis of the Save the Nation and Land also made a similar call to "shun those who visited Iran, and they may not take part in communal events." The organization plans to place ads in the religious press, with the pictures and addresses of the men to be excommunicated. The organization issued this statement: "While the entire world is shocked at the provocative threats to destroy the Jewish presence in the Land of Israel, Jews dressed as hareidim come to identify and show solidarity with the leader of Iran, may his name be erased. Aside from the terrible desecration of G-d's Name before the whole world, this is also aid and cooperation for the plans of enemies of Israel to carry out another Holocaust, may G-d save us, upon millions of Jews. These despicable people must be excommunicated, and every Jew is forbidden to have contact with them and certainly not to include them in prayers and the like." The hareidi religious Eida Hareidit, an anti-Zionist Jerusalem-based council of Hassidic courts and other hareidi religious groups - including the Neturei Karta - was equally harsh in its response to the group’s actions. Editor Shmuel Popenheim wrote in his piece, “Those people’s distorted anti-Zionist zealotry, which is sanctified in their eyes above and beyond the opinion of our Torah sages, brought them to that conference.” He stopped short of endorsing the call for a cherem on the group, and estimated there were no more than ten people in all of Israel who supported the group’s actions and perhaps some 25 others worldwide. They attended the funeral of former Palestine Liberation Organization chairman and chief terrorist Yasser Arafat, and have been funded by Palestinian Authority terrorist organizations. Documents discosed by the Intelligence and Terrorism Information Center and the Center for Special Studies (CSS) reveal that Arafat paid more than $50,000 to Hirsch, considered the “foreign minister” of the anti-Zionist Neturei Karta sect. CSS stated that the documents uncovered during Operation Defense Shield carried out in Jenin by the IDF in April 2002 showed that Arafat paid $25,000 and $30,000 in January and February of that year for “expenses for activities.” The investigators noted that Neturei Karta frequently supported Arafat and served as a propaganda tool for him. Me: The fight is not over. Please sign the petition and forward it to everyone you know. Look who was at the "Holocaust Conference" in Tehran deciding whether or not the Nazis killed 6,000,000 Jews. Their true self-hating, Uncle Tom, Erev Rav agenda is finally clear: they do not just oppose Zionism. 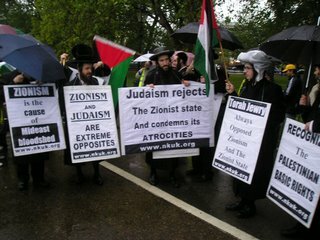 The oppose Judaism and the Jewish Nation. Since they embrace our enemies, they must be counted among our enemies. 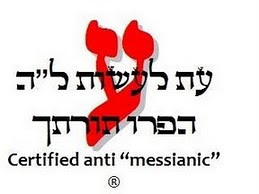 I call on all Orthodox Batei Din, Organizations and Yeshivos to unequivocally place these enemies of G-d into Cherem immediately or reaffirm their ban. The following is taken from The Mesha Stone discovered intact in 1868 (subsequently broken by Arabs and in 1873) then taken to the Louvre. Bolding is mine. between 840 and 820, perhaps about 830 B.C. in round numbers." I (am) Mesha, son of Chemosh-[ ... ], king of Moab, the Dibonite—my father (had) reigned over Moab thirty years, and I reigned after my father,—(who) made this high place for Chemosh in Qarhoh [ . . .] because he saved me from all the kings and caused me to triumph over all my adversaries. As for Omri, king of Israel, he humbled Moab many years (lit., days), for Chemosh was angry at his land. And his son followed him and he also said, “I will humble Moab.” In my time he spoke (thus), but I have triumphed over him and over his house, while Israel hath perished for ever! (Now) Omri had occupied the land of Medeba, and (Israel) had dwelt there in his time and half the time of his son (Ahab), forty years; but Chemosh dwelt there in my time. And I built Baal-meon, making a reservoir in it, and I built Qaryaten. Now the men of Gad had always dwelt in the land of Ataroth, and the king of Israel had built Ataroth for them, but I fought against the town and took it and slew all the people of the town as satiation (intoxication) for Chemosh and Moab. And I brought back from there Arel (or Oriel), its chieftain, dragging him before Chemosh in Kerioth, and I settled there men of Sharon and men of Maharith. And Chemosh said to me, “Go, take Nebo from Israel!” So I went by night and fought against it from the break of dawn until noon, taking it and slaying all, seven thousand men, boys, women, girls and maid-servants, for I had devoted them to destruction for (the god) Ashtar-Chemosh. And I took from there the [...] of Y-H-V-H, dragging them before Chemosh. And the king of Israel had built Jahaz, and he dwelt there while he was fighting against me, but Chemosh drove him out before me. And I took from Moab two hundred men, all first class (warriors), and set them against Jahaz and took it in order to attach it to (the district of) Dibon. Me: Calls for Israel's destruction. Intoxicated by blood lust and killing. Calling Israel "occupiers." Killing for god. Murdering innocent women and children. Destruction of Jewish religious places. Whew. Glad we don't live in that kooky era! Bolding is mine. Everyone should buy this man's book and support him. He is a voice of sanity in an insane world. What they capture, they keep. When they lose, they complain to the U.N.
RAYMOND IBRAHIM is a research librarian at the Library of Congress. His book, "The Al Qaeda Reader," translations of religious texts and propaganda, will be published in April. Carter has finally lost it. On the upside we get to see a no holds barred Judeophobe strut his stuff. Ready for a "Palestinian State?" Here's what goes on in Israel. Rabbi Shushan said that in his 30 years in the city, he had "never experienced an Arab pogrom like this one... I don't know what's going on here." Several days ago, a band of Arab youths attacked and cruelly beat a Jewish girl. Six months ago, local Arabs burned trees standing at the entrance to the Talmud Torah, and during the recent Simchat Torah holiday, Arabs surrounded students from the local Yeshivat Hesder [who combine Torah study and army service] and threatened them, until one student was forced to fire in the air to disperse them. Knesset Members of the National Religious Party-National Union visited Acco a month ago, warning of the deterioration in the city. The police claimed at the time that the violence and clashes were of a criminal, not nationalistic nature." When we toured the city a month ago," MK Uri Ariel said today, "it was claimed that we are provocateurs and looking for trouble. 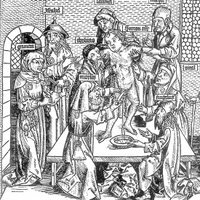 This pogrom in the Talmud Torah proves that the bitter reality is that in the year 2006, anti-Semitic pogroms take place in sovereign Israel. The police in Acco must give an accounting as to how it is that Arab rioters feel free enough to carry out such a despicable act. We won't allow the police to evade its responsibility." "We have no illusions," Ariel said. 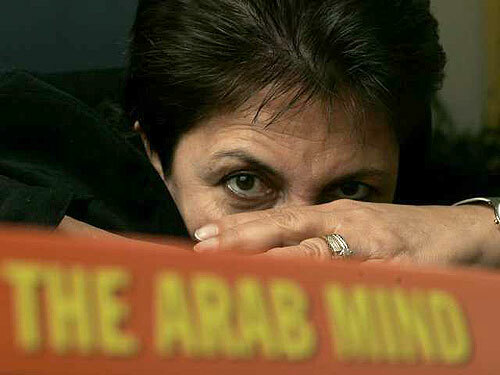 "We know what the Arabs are trying to do. They have composed a new Declaration of Independence, and they want to change the [Israeli] flag and anthem. The Arab citizens understand the trend, and they go out and paint swastikas in yeshivot." In another city with a large Arab population, Ramle (near Tel Aviv), an Arab organization is renewing its activities for more say in city affairs - and is hoping to similarly encourage Arab populations in other mixed cities such as Jaffa and Lod as well. New low for the Muslim world. LA Times needs to buy a dictionary. Clashes continue as the army looks for rocket launchers in Gaza. A top Palestinian militant is among the dead. JERUSALEM — Fighting in the Gaza Strip on Thursday killed at least six Palestinians, including a militant commander, as Israeli forces continued a drive to stop cross-border rocket attacks into southern Israel. Amid the clashes, a 57-year-old Palestinian woman blew herself up near Israeli soldiers, slightly injuring three. The suicide bomber was identified by family members as Fatma Najar, a grandmother and member of the military wing of the ruling Hamas movement. Female suicide bombers are relatively rare, and those older than 30 rarer still.The Israeli army said the woman approached troops near the farming town of Beit Lahiya, in northern Gaza, and set off the explosives after soldiers spotted her and hurled stun grenades. It was the second time in recent weeks that a female suicide bomber set off explosives near soldiers operating in northern Gaza. On Nov. 6, a woman blew herself up near soldiers during a raid in the town of Beit Hanoun, slightly injuring one of them. "I received the news with happiness. We are all proud of our mother. She was always hoping to be a martyr," her 32-year-old son, Fuad, said as well-wishers handed out sweets and tossed flowers outside the family home in Jabaliya. Elsewhere in Gaza, an Israeli airstrike killed Fayek abu Qumsan, the northern Gaza commander of the Popular Resistance Committees, one of the groups that fire homemade Kassam rockets over the border into southern Israel. He is the brother of one of the organization's founders, who was killed in an Israeli attack three years ago. Palestinian militants clashed throughout the day with Israeli troops, who were backed by tanks and aircraft, on the edges of several communities in northern Gaza. Also killed in the fighting were gunmen belonging to Hamas and Islamic Jihad. A 22-year-old Palestinian civilian also died, medical workers said. The Israeli push, which began this week, is the army's latest attempt to prevent militants from launching the Kassams. Previous efforts, including raids, shelling and airstrikes, have failed. Militants have launched 166 rockets this month, including five Thursday, the army said. Palestinian officials criticized the Israeli incursions as a dangerous escalation." It's not enough for Israel to control every aspect of life in Gaza, it has to visit untold horrors on an imprisoned and embattled civilian population," said Saeb Erekat, the chief Palestinian negotiator. "This is a war crime that the international community must address." Late Thursday, a spokesman for Islamic Jihad said militant groups, including Hamas, had agreed to stop firing rockets if Israel ceased attacks on Gaza and the West Bank. But an Israeli government spokeswoman quoted by Reuters said Israel would stop its military activities only when militants also halted the smuggling of explosives and the manufacture of rockets. The fighting took place as the Syrian-based political leader of Hamas, Khaled Meshaal, was in Cairo for talks with Egyptian officials who are seeking to broker a deal to free Israeli army Cpl. Gilad Shalit. Shalit, now 20, was captured and taken into Gaza on June 25 after militants tunneled under the border. Egypt has sought to have him freed in return for Israel's release of hundreds of imprisoned Palestinians. Meshaal's visit raised hopes for a deal. Israeli military commanders have considered plans for a wide-scale incursion into Gaza to stem the attacks, but a major offensive in the crowded enclave carries political risks for Israeli leaders and the possibility of high casualties on both sides. Me: Here's a translation for those of you who don't speak "pandering"
I am vehemently against giving gifts on Channukah as I believe it is a foul imitation of the gentile practice of gift giving on Xmas (they should live and be well). Imitating non-Jews is the exact opposite of what Channukah is about. That being said... for this I'll make an exception! Thanks to A Simple Jew for bringing this to my attention. Judah get's his MySpace on. Check out my new MySpace site that connects to this blog. Weird world, MySpace. Not sure just yet how I feel about it. Nothing is by chance. What is one way to say thanks and praise to Hashem in Hebrew? Hodu. How do you say Turkey (the bird) in Hebrew? Hodu. Where did Columbus think he was going before landing in North America? India, which in Hebrew is... Hodu. I have extreme Hakaras HaTov to the United States. All American Jews should. America is truly a special country and I don't take my liberties and fredoms lightly. I am proud to be a citizen. 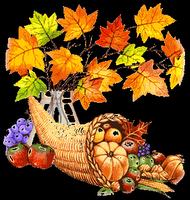 But here's my question: When I make aliyah, do I have to hold two days of Thanksgiving? Save Israel. A great site. The Syrian Muslim Brotherhood (SMB), in alliance with the ex-vice- president of Syria, Abdul Halim Khaddam, a staunch Ba’athist, have opened an office in Washington DC. The aim of the office is to infiltrate the US government and influence its apathy towards political Islam. Ammar Abdul Hamid, a Syrian intellectual who works at Brookings Institute, will be running the office for the National Salvation Front. 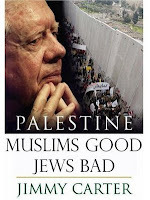 His duties are to sell political Islam and Ba’athism to reluctant US government officials and to give the Muslim Brotherhood a platform in the Think Tank community of Washington from which they can preach democracy. Arutz Sheva gets it right once again! Many people are saying the parade is "called off." It's not. They are still gathering in Yerushalayim and in my humble opinion the protest must be brought there. Is their gathering in a stadium any less disturbing or wrong? "Afterwards, at approximately 4 PM, it was learned that the leaders of the largest groups of protestors - hareidi-religious sage Rabbi Yosef Shalom Elyashiv and Eida Hareidit head Rabbi Yitzchak Tuvia Weiss - had agreed not to protest against the planned stadium rally tomorrow. However, their conditions include: the release of all the hareidi protestors arrested this week, no parade next year, and no signs of the rally outside the stadium. It is likely that only the first condition will be fulfilled." What? How is that okay? With all due respect to the Rabbaim, toeiva is toeiva. Torah Jews must stand up for Kiddushas Eretz Yisrael and Hashem's word. Last time I checked, Givat Ram was still in Jerusalem. וְגַנּוֹתִי אֶל הָעִיר הַזֹּאת לְהוֹשִׁיעָהּ"
For I will defend this city to save it"
"We have heard the news and the earth trembles and shakes from the voice of masses of reshoim who seek to defile the holy city of Jerusalem, the King's palace, with one of the worst abominations and ugliness of the nations of the world. Woe be the ears that hear such things and woe unto us in whose days this is transpiring. The holy Torah warns against the serious repercussions, chas vesholom, therefore we are worried and fearful over the repercussions acts such as these could bring upon the entire Yishuv, Hashem yishmor. Therefore we call on every Jew who has a reverent fear for the honor of our holy Torah and the honor of Jerusalem, the holy city, to protest against the above abomination in Ir Hakodesh in particular, and in Eretz Hakodesh in general. And may He Who spreads his succas sholom spread His succas sholom over us and over all of His nation of Israel and over Yerushalayim. " Hey, no rush. Take your time. The Vatican on Wednesday asked Israel to ban a gay parade this week in Jerusalem, saying the march in the city considered holy to Jews, Muslims and Christians would offend the faithful. Thousands of gay activists are expected to march in Jerusalem on Friday. "The Holy See has reiterated on many occasions that the right to freedom of expression ... is subject to just limits, in particular when the exercise of this right would offend the religious sentiments of believers," the Vatican said. "It is clear that the gay parade scheduled to take place in Jerusalem will prove offensive to the great majority of Jews, Muslims and Christians, given the sacred character of the city of Jerusalem," it said. Here come da Judge! Gettin' scared? ISLAMerica: HEZBOLLAH JUDGE ELECTED in MICHIGAN! 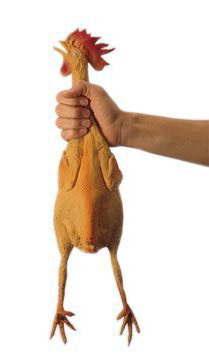 I would like to add the following to yesterday's post. 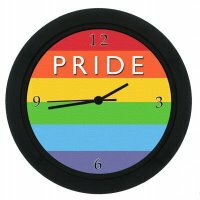 I caled for peaceful demonstration against the "gay pride" marchers. However, Jews have a right to defend themselves against physical aggression. If the Israeli police continues to use force against Jews who are protesting, then there is no reason not to fight back. More Islamic Revisionism (read: lies) - and my thoughts on the "Parade"
Responding to a plan to build a synagogue on Judaism's most sacred site, Sheikh Raad Salah warns that the entire complex is Moslem. Islam was founded 550 years after the Jewish Temple was destroyed. Sheikh Raad Salah - head of the Islamic Movement in Israel, a Hamas supporter, and an outspoken enemy of Israel - warns that Israeli plans to build a synagogue on the Temple Mount could lead to violence and bloodshed. "The day will never come when a Moslem or an Arab will have the right to cede even one foot of the Al-Aqsa Mosque or of Jerusalem," the Sheikh's Al-Aqsa movement announced. Why is this man allowed to be "Israeli?" The Temple Mount in Jerusalem was the site of the two Jewish Holy Temples, the first of which was built by King Solomon in the year 832 BCE, close to 1,500 years before Islam was founded. For most of the next 1,000 years, Holy Temples stood on the site, until the Romans conquered the entire land and destroyed the Second Temple. Though the area came under the control of the Romans, Byzantines, Moslems, Christians, Turks, British and others over the coming centuries, Jerusalem and the Temple Mount were always the focus of Jewish religious and national yearnings and continued to be the Jews' "capital in exile." In the Six Day War of 1967, the modern state of Israel liberated the Temple Mount area, placing all of Jerusalem under Jewish control once again after a hiatus of 1,900 years. Israel, however, never actualized its sovereignty over the holy Temple Mount site, but rather granted the Moslem Waqf nearly total control. Jews, in fact, have not been allowed to pray there ever since then-Chief IDF Rabbi Shlomo Goren led a prayer service there on the first Tisha B'Av after the liberation. As Arutz-7 reported nearly two months ago, MK Uri Ariel (National Union) is preparing a plan for the construction of a synagogue on the southeastern corner of the Temple Mount. The plan must be approved by the Jerusalem municipality's planning committee - an unlikely eventuality - and Ariel is set to meet with rabbis and public figures on the issue later this week. MK Ariel notes that such a building would "rectify a historic injustice," and that every Supreme Court ruling on the issue has recognized the right of every Jew to pray on the Temple Mount. "The synagogue will not interfere with believing Moslems who wish to pray at the Al-Aksa Mosque," Ariel said. "On the contrary, this is an opportunity for the Moslem world to demonstrate and prove that it is tolerant enough." The "Moslem world" is not jumping at said opportunity. The announcement by Sheikh Salah's organization states, "We hereby warn aloud about the existence of a Jewish national consensus that is trying to build the Holy Temple at the expense of the Al-Aqsa Mosque. We warn that similar plans were submitted to Ariel Sharon and Ehud Barak and their publication led to violence, the ramifications of which have not ended to this day." "The timing of the publication [of this plan] is not coincidental," the Islamic Movement states, "and it jibes with the increased calls for expulsion [of Arabs], the implementation of the policy of religious persecution and national discrimination, and the giving of a green light to the construction of the Third Temple." I thought they didn't recognize any of the Temples. Hmmmmmm. "We remind, for the 1,000th time, that the entire Al-Aqsa mosque, including all of its area and alleys above the ground and under it, is exclusive and absolute Moslem property, and no one else has any rights to even one grain of earth in it." "We remind the Israeli establishment, which stands behind these plans, that the problem of Al-Aqsa and Jerusalem is not just a Palestinian problem, but a Palestinian, Arab and Islamic problem. The day the Al-Aqsa Mosque is harmed, Heaven forbid, all the Arab and Islamic nations will call to prevent this damage. Watch out! Beware of merely the thought of hurting or desecrating the mosque." Me: I have, for a while, wanted to post on Ariel's idea to build a synagogue on the Mount. I think the idea is a Chilul HaShem. Here's why... We, as Jews, believe in the coming of Mashiach. Even the nutty NK-niks believe that there will be Ultimate Redemption. The Mount does not need a synagogue. It needs a Temple. And a Temple, our Temple, will only be built (and rebuilt) when Mashiach comes. 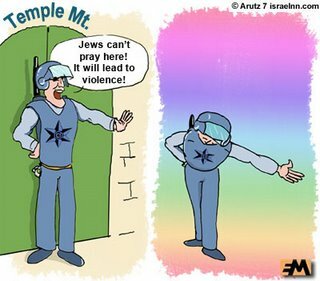 Should Jews be allowed to pray on the Mount? Yes. If the Israeli Government would grow a pair and ensure the safety of the worshippers, then it's a no brainer. It shouldn't be our problem that the State decided to give up the religious, spiritual and historic home of Judaism to our enemies. It is ours whether the Waqf says so or not. It's ours regardless of the UN. It's ours whether the State of Israel says so. It should be the Muslims who have to go through security and have Jewish religious courts watching them with eagle eyes, not the other way around. ALL Muslim construction on the Mount must be immediately halted. All "addtions" to the Muslim structures must be immediately halted. (See HERE) All Muslim clearing of "rubble" (read: Jewish artifacts) must be immediately halted. Every person leaving the Mount must be searched. Jews must be granted access and allowed to pray without Muslim harassment. That being said, as for a shul on the Mount, I say no way. The Mount is not political, it is religious. It is Holy and one of a kind. We need to re-earn our right to build on it. It's not some plot of land you can just throw a building on with a head Rabbi, Sisterhood and Kiddush Committee. 2. Respect Jerusalem. Don't throw your cigarette butts on the ground or litter. It goes without saying that lighting your garbage in the street in protest should be assur. This is the holy city. Treat it that way. Jerusalem should be treated like gold... it's much more precious. 3. Respect your fellow Jew. See him as your brother. Invite the non-religious over for Shabbos and be a Kiddush HaShem. SHOW him or her the proper derech. Let's bring our secular brothers and sisters back to G-d through love and example. Finally, as you all know, I am dead set against this "Toeva" parade. But I strongly urge all Jews to avoid violence at all costs. Sit in the middle of the road. Daven. Say Tehillim. Shout. Cry. Wail. Beat your chest. But throwing rocks at policemen or stabbing a marcher? No. We have right on our side. Don't give the world, or other Jews, any reason to see us as fanatic or violent. A lot of these marchers will be Jews. Show them that they can change. That Hashem wants them to repent. That they can give up their sin. Am I saying sit back and let the marchers provoke you? Not at all. 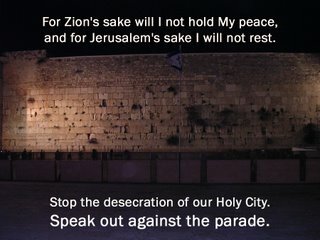 Defend Jerusalem's sanctity. Just don't be violent. Let's bring Klal Yisrael together. Then HaShem will rebuild our Temple. From his bio: "Shlomo Katz was born into a family of musicians. This rich musical heritage goes back many generations including his father, master musician and chazzan, Avshalom Katz. Shlomo was born in New Jersey but grew up in Raanana, Israel. From his youth, he has sung in choirs, on television and demonstrated his of love music and passion for Torah. 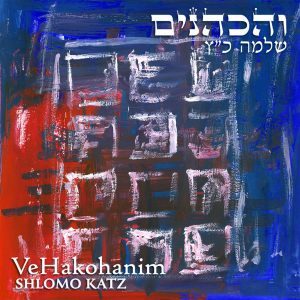 He is a prolific composer of beautiful music, both solo and in collaboration with his brother, Eitan, Yehuda Solomon and Chaim David." Tel Aviv synagogue sprayed with warnings not to cancel parade. 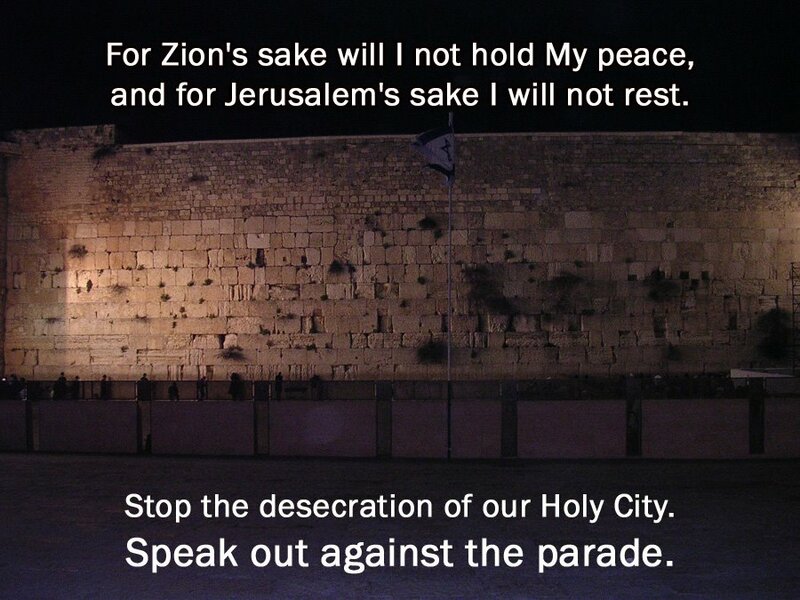 A Tel Aviv synagogue was sprayed Wednesday night with a slogan warning against attempts to cancel the parade. The slogan read "if we can't march in Jerusalem, you won't walk around in Tel Aviv." 'Fast of Rabin,' initiated by Reform movement, set to be added to other fast days in Jewish calendarTo commemorate Yitzhak Rabin's death, the Jewish Reform Movement has initiated The Fast of Rabin, similar to The Fast of Gedaliah. The Fast of Gedaliah commemorates the assassination of Gedaliah, the Babylonian-appointed official charged with administering the Jewish population remaining in Judah following the destruction of the Temple and exile in 586 B.C.E. Ahead of the memorial day commemorating Rabin's murder, the reform movement's rabbinical council issued a public statement confirming that the memorial day will be deemed a public fast day. It is set to be added to other days of fast in the Jewish calendar. The rabbinical council has emphasized the need for personal and public introspection on this day in wake of the murder and its circumstances. Me: Deep introspection. Like, "why don't I follow the Mitzvos" and "why do I follow a religious sect that goes against the very foundations, traditions and beliefs of the religion? Are there Muslims who don't believe in Muhammed and the Quran? Are there Christians who don't belive in Jesus or the 'New' Testament?" Hmmmm. Deep thoughts. Similar to other public fast days, the movement's rabbis will not conduct weddings and other joyful events on this particular day. The reform community is set to conduct special prayer sessions to mark the day of Rabin's murder. Me: What a shame. So many intermarriages will have to be postponed. "To Whom it May Concern: If you are up there, ma'am, please forgive us. Rabin was like a god to us and even though the circumstances surrounding his death are still sketchy, we hope you will not be angry with us. Ps. Look forward to seeing you at the Gay Pride Parade in Jerusalem on November 10th! Amen." Jerusalem Affairs Minister Edri has asked the police to consider banning the Homosexual Parade in Jerusalem, scheduled for nine days from now. The police are leaning towards calling it off. Hareidi-religious affairs commentator Yossi Elituv said, "The fight against the march has knocked down all barriers in the hareidi and religious camps. The Hassidic sectors - Belz, Gerrer, and others - together with Litaim (non-Hassidic), as well as the Sephardi-hareidim and the religious-Zionist sectors - all are standing together against this parade." The police say they have received word that protestors are planning to throw eggs and razor blades at the marchers, flood the streets with sewage, block roads in Jerusalem and elsewhere, and even possibly perpetrate fake terrorist attacks. Elituv says these fears are "ridiculous and totally unfounded." He said he does not believe any violence is planned, but cannot rule out unpredictable acts by individuals. Army Radio's Micha Friedman asked a police official whether the police were "actually yielding to the threats of violent groups." The official said, "Let's not be naive. Such a parade would never be held in the Vatican nor in Mecca..."
Members of the Islamic Movement have also called for the cancellation of the parade. The police said they are planning to field 6,000 policemen in Jerusalem, with the addition of another 2,000 Border Guardsmen from their patrols in Judea and Samaria, on the day of the march, if it is held. Protests Have StartedHareidi protests against the march have already begun. Last night, hundreds attempted to block the main highway leading to the Old City from northern Jerusalem. Some protestors wore sackcloth and burnt garbage bins; the police used violence to remove them, and several protestors threw rocks. Four policemen were reported injured, while no word was received on how many protestors were hurt. Several of the latter were detained. Thousands of religious Jews legally blocked off the Sabbath Square intersection in the Me'ah She'earim neighborhood of Jerusalem two weeks ago, threatening to be out in even stronger force if the march is actually held. Religious and political leaders have called for, and said they will lead, active protests against the march. Tens of thousands are expected to take part in protests against the march on the day itself, and Jerusalem residents are signing up to host Jews from other parts of the country for the Sabbath that begins immediately following the end of the march. Noa Satat, the head of the Jerusalem Open House, which is organizing the march, said that the police have been working for weeks on plans to protect the march, and therefore she is certain that the police will "fulfill their legal obligation and protect freedom of expression." The Sanhedrin - a group of rabbis who say they have re-established the religious-legal assembly of 71 sages that convened as the Supreme Jewish Tribunal during the Holy Temple period and for several centuries afterwards - has called upon all synagogues to hold their upcoming Sabbath services on the streets. "Close your doors and pray outside," the organization calls, "as a sign of shame, warning and pleading for the abominable march to be canceled. We must not continue our regular routine while the police and courts force a march of abomination in Jerusalem upon millions of Jews against their faith and belief in the holiness of the city and the Torah's dictates." Police Commissioner Moshe Karadi announced that he has postponed his scheduled trip to Turkey next week, in light of the preparations needed for the march. Karadi was to have signed a cooperation agreement between the police forces of Israel and Turkey. Hundreds of Hareidi religious Jews in the Mea She'arim neighborhood of Jerusalem demonstrated in mourner's clothes Tuesday night against the planned parade by homosexuals next week.They were dressed in sack cloth, a sign of morning and marched to the adjacent neighborhood of Geula while shouting "Gevalt" [shock]. More protests are expected as the date of next Friday's planned parade nears. "For I will defend this city to save it"
Get involved. 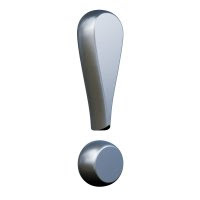 Please post on your blog or web site. Hefker. No link back or credit needed. FYI: Jerusalem Police Chief Ilan Franco can be faxed at 02-539 1466, and Jerusalem Mayor Uri Lupoliansky can be faxed at 02-629-6014. From abroad, replace the initial 0 with international access code and 972. Check out my first "Stop the Parade" banner. Feel free to poach and post. More banners and buttons to follow. I ask all my religious and Zionist readers and Blogger friends to act quickly and post your distaste for the "World Pride Parade" that will (H"V) take place on November 16th [JHK: Sorry, it's actually November 10th. My bad] in the Holy City. There will be cross dressing, youth recruitment, Sabbath desecration and countless other chilulei Hashem that must be prevented. Their last attempt to hold the parade ended up with Israel at war with Hizballah. How many messages can we get from the Holy One Blessed Be He and not respond? If you love Hashem, His Torah and his Holy City, then you have a chiyuv to speak out and make your feelings known. Blog. Write letters to the Mayor of Jerusalem. Organize a protest. Daven and say Tehillim. Sign a petition. Jews, Muslims and Christians must unite to stop this parade and protect Jeruslaem's sanctity and Holiness from this outward provocation. There are thousands of other cities in which this parade could have been held. Having it in Jerusalem is a direct provication against the Orthodox Jewish world, devout Muslims and faithful Christians. If you are still not convinced... I add these web sites here. WARNING they are not for the fainthearted and are very un-tznius. But it does give you an idea what's coming. Please do not click on the sites if you think it will effect your neshoma. It will as they are very disturbing. Please do not hold me responsible... I am offering them as a service for those who want to be educated on this group. I do not want to bear the sin of you seeing it, so I humbly ask that you say outline: "I do not hold Yehudah HaKohain responsible for my actions and I do this on my own free will." I just stepped in from seeing Rav Amnon Yitzchak in Los Angeles. The lecture was supposed to start at eight o'clock. It did not begin until much later. It was hot. It was stuffy. There were not nearly enough seats for those who came to hear him. The Fire Marshal of Beverly Hills would not let the lecture begin until people left the aisles and back of the shul. People were pushing their way in and the doors had to be held to prevent more people from pushing their way in. It was such a balagan that my five year old son was getting scared. Throngs of Israelis and Persians refused to vacate the area and that led to shouting matches and protests. Those seated wanted the lecture to begin. Those standing did not want to leave. It was one of the most incredible and special moments of my life. I don't know if you can imagine it. There were 1,4000 pushing and shoving for Torah. Busses of people came from Arizona to see him and many people in Israel were watching it live at 5:30 am local time. I have been to concerts. I have seen many movie and TV stars in Hollywood. Their fans are nothing like this. Those worshippers of false "idols" have no real soul or purpose to their adoration. These people were literally pushing and screaming for G-d and His Torah. The hunger and desire of these people was so potent that when the Rav came out the place erupted. I actually cried. I turned to my sons and I said: "This is what it will be like when Mashiach comes." To which my ten year old son replied: "except there will be a few more billion people." The Rav had an aura around him. His holiness and love for HaKaddosh Baruch Hu permeated everyone there. People shouted, danced and sang just at the sight of him. I have never said this of anyone. Could this man be Mashiach? Watch the videos (subtitled). Listen to the lectures (in Hebrew). Donate to help him in his work. ""The bigger the lie, the more people will believe it"
During the month of Ramadan, Palestinian Authority television programs focus on religious themes. But even within these programs, PA TV inserts political, hate and violence messages directed at Israel. PA TV is run by the office of PA President Mahmoud Abbas. The true name of the Western Wall of the Temple, according to the PA academic, is really the Al Buraq Wall – named after Muhammad’s horse which was tied to the wall – according to an Islamic tradition that attempts to honor Jerusalem. Finally, Khader praises all the violence and death the Palestinians have initiated to prevent Jews’ access to the Western Wall and Temple Mount, from the beginning of the 20th century until now, and indicates that it will continue if Jews insist on the right to the Western Wall. Khader: “The issue of the Al-Buraq Wall [Western Wall – renamed by Muslims "Buraq Wall" after Muhammad's horse] is one of the wonders which we don’t know why it happened in this order [of historical events]. Who would have believed, back then, when Islam began in the time of the prophet, who would have believed that the Israelis would arrive 1400 years later, conquer Jerusalem and would make this wall into their special place of worship, where they worship and pray? It’s incredible! We did not invent this place, the Al-Buraq Wall. Know that this wall is the only one of the four walls of the Al-Aqsa Mosque - the Mosque has four sides - this wall is the only one that carries an Islamic name since the beginning of Islam. Allah, praise Him, gave Al-Aqsa its name, and the Al-Buraq Wall was named by the Prophet… The Al-Buraq Wall is the station, similar to a space station, where Al-Buraq [Muhammad’s horse] landed. This is the place where Al-Buraq landed and the prophet tied Al-Buraq [to the wall]. Me: It never fails to amaze me how far the Arab/Muslim world will go to lie. Do they actually believe their own fantasy or is it one big "wink wink" among them? Eventually these lies will become "truth" as the Nazis have shown us. Where are the Christian Arabs who read their Bible? Why aren't they speaking out? A better question... why aren't we speaking out more? Kudos to PublicansDecoy for posting this sick display. And guess who made an appearance? Why it's the erev rav! Doctors in Gaza have reported previously unseen injuries from Israeli weapons that cause severe burning and deep internal wounds often resulting in amputations or death. The injuries were first seen in July, when the Israeli military launched a series of operations in Gaza following the capture of an Israeli soldier by Palestinian militants. Doctors said that, unlike traditional combat injuries from shells or bullets, there were no large shrapnel pieces found in the patients' bodies and there appeared to be a "dusting" on severely damaged internal organs. "Bodies arrived severely fragmented, melted and disfigured," said Jumaa Saqa'a, a doctor at Shifa hospital, the main casualty hospital in Gaza City. "We found internal burning of organs, while externally there were minute pieces of shrapnel. When we opened many of the injured people we found dusting on the internal organs." Read the rest of the C**p HERE and be sure to drop them a line. Following a six-week legal struggle, the police in Hevron informed Yehuda Cohen of Bat Ayin at the end of last week that it had changed its mind about confiscating his gun license. The Yesha (Judea and Samaria) Civil Rights Organization (YCRO), headed by Orit Strook of Hevron, calls upon the Jewish residents of Yesha to fight against the police tendency to revoke their weapons. Cohen, a shepherd, complained in the summer of repeated Arab stalking and attacks against his fellow shepherds. In once case, a shepherd even required medical treatment in a hospital. To Cohen's surprise, his complaints led the police not to take action against the Arabs, but rather to revoke his weapon. The police said this would "prevent future clashes. "YCRO decided to fight, together with Cohen, against what they called this "arbitrary police decision" - and the police finally gave in, informing Cohen's lawyer, Naftali Wurtzberger, that it was no longer seeking to confiscate Cohen's gun. YCRO's Orit Strook expressed satisfaction with the decision, and called upon the police to change its entire approach. "It cannot be that the way to avoid Jewish-Arabs always comes at the expense of Jews' basic civil rights," she said. "The police must stop looking for the coin under the streetlight. Law-enforcement must be more objective and more equalitarian. "Strook said that Yesha residents whose weapons are confiscated by the police must not accept this passively, "as such decisions may have been made with irrelevant motives and may not stand up to judicial and objective review." Be sure to read on an empty stomach. 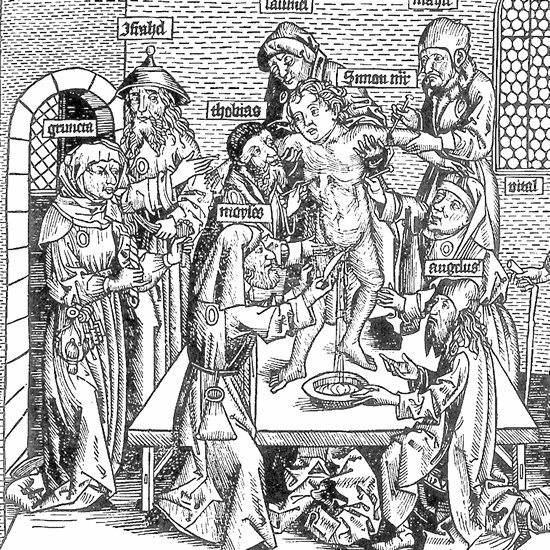 "...the first volume of Vestitus Sacerdotum Hebraeorum - the Clothing of the Jewish Priests. Published 1680. In Latin and some Hebrew, vellum binding..."
Click above. Be sure to scroll down as auction has ended. Iranian president says has been in touch with God, who reassured him Tehran victory against West is guaranteed. What kind of shmeggege would buy in to such stupidity? Fanatic Islam stole 32 years of my life, Syrian-American psychologist tells Ynet in an exclusive interview. Sultan gained notoriety for a televised debate broadcast on Al-Jazeera in which she harshly criticized Islam; now she wants to visit Israel, she tells Ynet. What happened to the 50 tons of gold, silver and sacred treasures looted from Herod's Temple following the Roman legionnaires' sack of Jerusalem on Tisha b'Av in the year 70 CE? The Arch of Titus in Rome, erected shortly after the death of Titus who reigned as emperor from 79 to 81, clearly depicts Roman soldiers bearing on their shoulders the golden candelabrum, silver trumpets and bejewelled Table of the Divine Presence which the Roman emperor Vespasian and his son Titus carted back to Rome as trophies of war. Between 75 CE and the early 5th century, the treasure remained on public display in the Temple of Peace in Rome's Forum. Many Jews believe – almost as an article of faith – that the Temple artifacts remain there in Rome, secreted away in vaults beneath the Vatican. But in a newly published book, British historian Sean Kingsley, basing himself on untapped historical texts and new archaeological sources, argues that the treasures were removed from Rome after the Vandal invasion of 455 CE. Kingsley, whose book God's Gold: The Quest for the Lost Temple Treasure of Jerusalem was released October 5 by John Murray, says that the loot was first taken to Carthage in Tunisia, then to Hippo Regius in Algeria, and on to Constantinople – today known as Istanbul, Turkey, before finally being returned to the Holy Land in the mid 6th century. At that time, the treasures were ultimately hidden in the Judean wilderness, beneath the remote Greek Orthodox Monastery of St. Theodosius, 12 km east of Bethlehem. It's a plausible argument that has almost messianic implications. If the Temple treasures were retrieved, the discovery could help lead to the actual rebuilding of the Temple, the resumption of biblical sacrifice – and the coming of the Messiah. “One thing is for sure – it is not imprisoned deep in Vatican City. I am the first person to prove that the Temple treasures no longer languish in Rome,” says Kingsley, an expert on the East Mediterranean economy in Late Antiquity. Kingsley’s sources include Josephus Flavius, the 1st-century Jewish general turned renegade who chronicled the history of the failed Jewish revolt against Rome. Kingsley also found evidence in, among others, the works of Procopius, a court historian of the Byzantine Emperor Justinian, who died in 562, and from Theophanes Confessor (c.760-817), a Christian monk from Constantinople. In Chronographia, which spanned 284 to 813, Theophanes recorded that Geiseric the Lame, king of the Germanic tribe of the Vandals, loaded the treasures that "Titus had brought to Rome after the capture of Jerusalem" on a boat and took them to his North African capital Carthage in 455. Although history remembers the Vandal sack of Rome as extremely brutal (and their act made the word 'vandalism' a term for any wantonly destructive act), in actuality Geiseric honored his pledge to Pope Leo I not to make war on the people of Rome. The Vandals did however take gold, silver and many other things of value away from the city. In the crusade of 533 to restore the lost Roman provinces of North Africa, the Byzantine general Flavius Belisarius seized the treasure from a Vandal ship fleeing the harbor of Hippo Regius, today known as Annaba or Bone, Algeria. It was then shipped to Constantinople, the capital of Byzantium. In recognition of Belisarius' great victory, the Emperor Justinian granted him a Roman triumph (the last one ever given) upon his return to Constantinople. In the procession were paraded the spoils of the Temple of Jerusalem which Belisarius had recovered. In the 7th century, the Persians sacked Jerusalem, killing thousands of Christians, and dragging the Patriarch Zacharias to Persia. Kingsley believes that his replacement, Modestus, spirited away the treasures to their final hiding place in the Judean Desert in 614. The Monastery of St. Theodosius, where Kingsley believes the relics may be today, was founded in 476. According to Kingsley, "The treasure resonates fiercely across modern politics. Since the mid-1990s, a heated political wrangle has been simmering between the Vatican and Israel, which has accused the papacy of imprisoning the treasure. "The Temple treasure remains a deadly political tool in the volatile Arab-Israeli conflict centered on the Temple Mount [the site of the Jewish Temple and the Muslim Dome of the Rock]. Me: Need a bit more proof. Or ANY proof for that matter. Regardless, why aren't we going to in to the church to see if it's there? Where is Vendyl Jones? And G-d spoke to Moses saying: Speak unto Aaron and his sons, saying, in this manner shall you bless the children of Israel. Say to them: May the Lord bless you and keep you. May the Lord shine His face upon you. May the Lord lift His countenance upon you, and grant you peace. Meanwhile, there have been ongoing visits to the Temple Mount, Judaism's holiest site, throughout the week. Guided visits are being offered free of charge for those wishing to visit the permitted areas of the mount in accordance with Jewish law. National Union faction head MK Uri Ariel ascended the Temple Mount Monday morning, saying that there is special significance to completing one's pilgrimage at the actual site of the Holy Temple on the three festivals. Ascending today, even as the Holy Temple is not standing, broadcasts a message reminding the entire world and first and foremost Israeli society, that the Temple is the center and the heart of the Jewish nation," Ariel said. And we still expect and are prepared to rebuild it." Visits for Jewish men and women who wish to ascend the Temple Mount in accordance with Jewish law are being offered over the course of the Sukkot Festival. All tours begin at 7.30 AM, beginning at the Mughrabi Gate, adjacent to the main entrance to the Western Wall plaza. 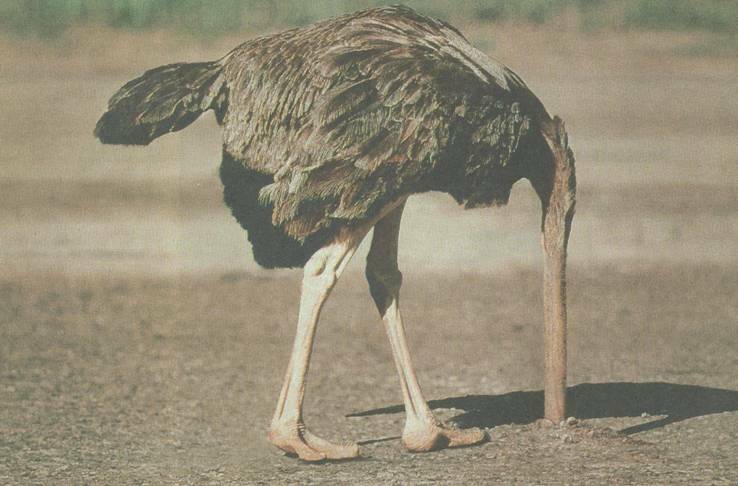 Having a nice discussion with someone who posted an "undercover video" of "Jewish Ritual Chicken Slaughter" on You Tube. My favorite line: "I don't believe slaughtering this animal or any animal gets anyone points with any GOD. " Hmmm, maybe we better rethink this whole Beis Ha-Mikdash thing. Feel free to join the yutz in debate. Dr. Wafa Sultan again tells it like it is.